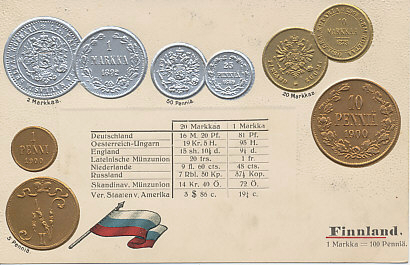 Embossed postcard of the flag and coins of Finnland, a region of Russia with substantial autonomy, with fixed exchange rates for major currencies including the German Mark, Austro-Hungarian Krone, British Shilling, the Latin Monetary Union Franc, Dutch Guilder, Russia Ruble, Scandinavian Monetary Union Krone/Krona, and United States Dollar. Includes images for 1, 5, 10, 25 and 50 Penniä coins, and 1, 2, 10, and 20 Markaa coins. The flag is that of Russia. Finland was a region of Russia, with significant autonomy, so much that Czarist police, and their revolutionary successors, had limited ability to pursue persons of interest, such as Vladimir Lenin who entered Russia from Finland after the February Revolution, and fled there after the July Days that summer. After the October Revolution that brought Lenin and the Bolsheviks to power, the Russian government quickly agreed an armistice with the Central Powers, but, in negotiations at Brest-Litovsk, could not reach agreement on a peace treaty. Leon Trotsky walked away from negotiations with the slogan 'no war, no peace,' a non-resolution that did not satisfy the German military which resumed its advance into Russia. Finland declared its independence in January, 1918. German troops landed in Finland on April 3, 1918, and entered Helsinki on April 11. 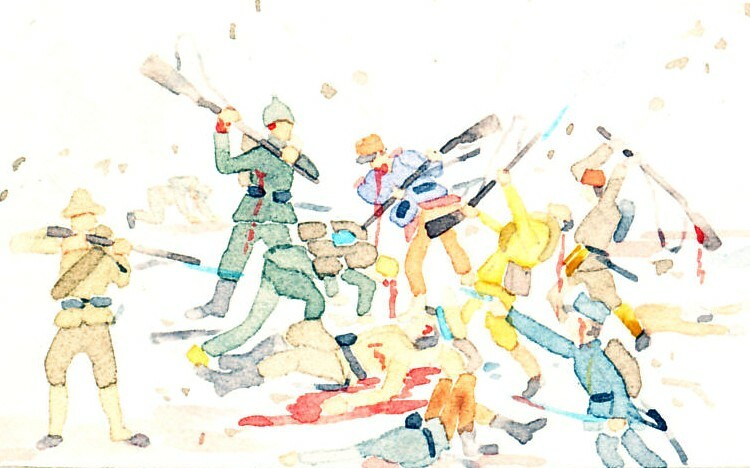 The Battle of Helsinki followed as Germans and White Russians fought and defeated Red Army forces. Finland is a region in Russia.